Janine Vangool has worked as a graphic designer and professor and is currently the publisher, editor, and designer of UPPERCASE magazine. She names an “obsolete writing machine” as the most beautiful man-made thing she’s ever seen and, like Harley Earl, grooves on midcentury automotive curves. Characterized by sumptuous tactility, pastel palettes, and delicate patterns, we suspect Ms. Vangool’s fem-forward design team could transform even Mr. Zouch into the crown prince of Luxe-Fashionista. 1) What made you want to become a graphic or industrial designer? I’ve always loved words and pictures; I used to make my own books when I was a little girl. 2) Who are your influences? UPPERCASE readers and their work are my biggest influence and inspiration. 3) What design movement(s) do you most identify with? Perhaps because my father restores cars from that era, my eye has been trained to appreciate the curves and styling of the Fifties. 4) How would you describe your “process”? My design process involves balancing big ideas with the realities of time and budget; a process of refinement. 5) What work(s) or project(s) do you consider your masterpiece(s)? Each issue of UPPERCASE is my masterpiece … until I’m working on the next one. Assigning content for our summer issue and invoicing stockists for our spring issue. 7) What’s your next project? Completing our next book The Typewriter: A Graphic History of the Beloved Machine which is a visual ode to everyone’s favourite obsolete writing machine. 8) How would you describe or categorize contemporary design? I feel removed from the world of contemporary graphic design; I feel more aligned with the craft and handmade aesthetic. Perhaps this is a trend in graphic design as well—looking away from technology to things with more soul. 9) What design movement(s) or designers do you dislike? I’ve never been a fan of the Memphis style of the 1980s. 10) What characterizes your work or style? Content comes first, design is secondary. 11) What is the most beautiful man-made thing you’ve ever seen? A typewriter: the 1956 Royal Quiet Deluxe in turquoise in my favourite model. 12) What’s the most exciting thing about your profession? The best part of the job is finding inspiring content and collaborating with talented people from around the world. It is very satisfying to see it all come together in print. 13) Which designer(s) should we keep an eye on? Surface pattern designer Elizabeth Olwen. 14) Who would be on your “fantasy design team”? Louise Fili to design an identity, Jessica Hische for a special lettering project, Danielle Kroll for illustration. Janine Vangool worked as a freelance graphic designer in the arts, culture, and publishing sectors and has also taught typography and publication design at the college level. 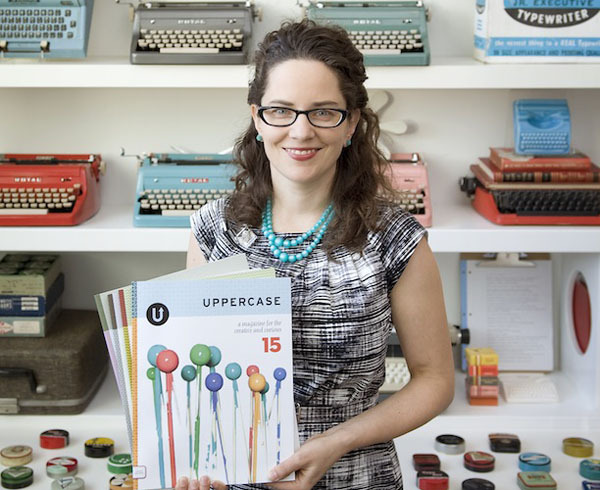 She is now the publisher / editor / designer of UPPERCASE, a quarterly magazine for the creative and curious. She has also developed and published many books under the UPPERCASE name. See shop.uppercasemagazine.com for more information and to subscribe. UPPERCASE magazine’s content is inspired by design, typography, illustration and craft. It celebrates the process of making, the commitment to craft and the art of living creatively. Dedicated to ink on paper, it has a fondness for obsolete technology like typewriters and Polaroids. Despite firm anachronistic associations, it is through social media that UPPERCASE has grown from a small idea into a publication that reaches all parts of the globe.